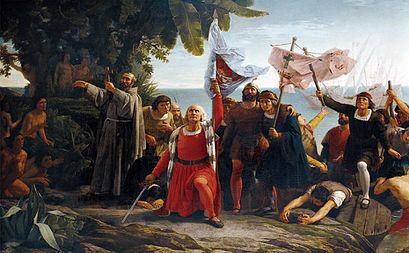 Most people in America remember this convenient rhyme that tells them when Columbus “discovered America” What they don’t teach us about the same year is that an even more momentous event occurred. On January 2 of 1492, Spain ended a war that had been going on against the Moors of Norther Africa for almost 700 years. You may remember from your school days a little about the Crusades – religious wars in which the Christians of Europe tried to conquer and hold the Holy Lands of the Bible – especially Jerusalem. Well, the Muslims and Moors, the people holding her Holy Land, had their own plans for conquest. They invaded the Iberian Peninsula (location of Portugal and Spain) in the 700’s and held large portions of it for over 700 years. The conquest had a profound effect on culture in the region. It was also, I believe, one important reason why Spain clung so relentlessly to the Catholic religion in a changing world. After all, the conflict between the invaders and the people had largely been a matter of religion. On January 2 pf 1492, the last of the Moors were expelled from Spain, and this made it possible for the Spanish government to do things like start programs to improve trade. Such actions included funding a crackpot named Columbus who thought he could reach India by sailing west. One of the major supporters of this expedition was Spain’s richest Jewish families. These Jews had entered the country as bankers, traders and money-lenders of the Moors, and had become important to the Spanish economy. Now, the government of Spain, long accustomed to wagging religious war against the Muslims, seemed about to turn on their Jewish neighbors. These were the days of the Spanish Inquisition. Today we can make jokes about it, but at the time it was deadly serious. The Catholic Church, ruler of the religious lives of all Catholics in Europe and the world, had decreed that people who did not worship in ways determined by the Church must be “taught the error of their ways.” This might involve public humiliation, confiscation of property, and/or torture. 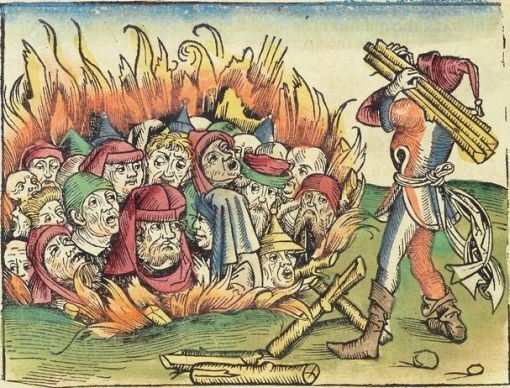 About 2% of those accuses were burned alive at the stake. 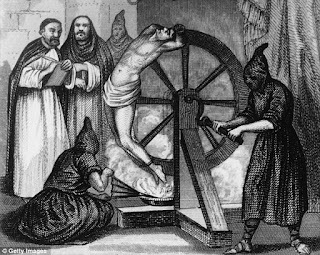 Since 1580, the Inquisition in Spain had been particularly dedicated to examining the religious life of the Jews. In order to better get along with society, many Jewish people had converted to Catholicism. 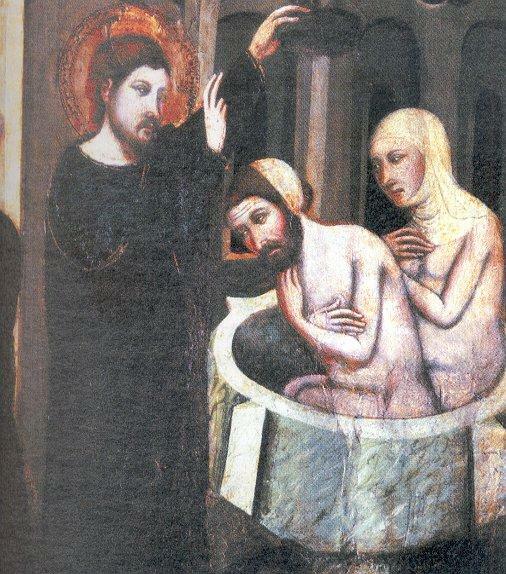 These New Christians were often called conversos and were subject to intense scrutiny by the ruling elite. The government suspected – sometimes correctly – that these so-called conversions were merely matters of form. Some of Spain’s Jewish citizens continued to practice their ancient religion in secret. Yet it was difficult to act against people who for centuries had carried out banking and trading jobs that Christians did not want to be involved in. Jews, and even the conversos had already faced suppression and unequal representation under the law. They had become suspect during the plague years of the 1300’s when desperate people looked for someone to blame for the sickness that destroyed whole cities. The Jewish population was handy scapegoat. In many cases, riots broke out that destroyed Jewish neighborhoods, and Jewish citizens were driven from their homes or killed outright. When a rich Jewish converso actually staged a rebellion in northern Spain in 1580, the stage was set for a massive retaliation against anyone of Jewish heritage. So the Jews of Spain began to look for somewhere to go where they could be safe. Already the Jewish populations of England and France had been expelled from their former homes. And it is believed that Jewish bankers provided at least some of the money to finance Columbus, as well as encouragement to the king and queen of Spain, Ferdinand and Isabella to explore the world. Jews from Spain may have migrated to Jamaica as early as 1494. In order to hide their origins, they settled as “Portuguese” and lived in their own communities. Only when England overtook the island in 1655 did they dare to revel themselves. An edict by King Charles in 1660 granted them citizenship, but Jewish citizens still did not receive equal rights with non-Jews until 1835. 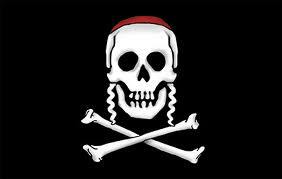 Once established in the New World, many Jews went on to support and finance pirates. Whether their motives were purely those of profit or if they were seeking retribution for a country that had invented an entire action of the Church to hunt them down can only be imagined. But ships named after old-testament figures such as Prophet Samuel, Queen Esther and Shield of Abraham held privateering licenses and attacked Spanish shipping. In fact, it was a Dutch pirate of Jewish descent who is credited as the only captain to have ever actually captured a Spanish treasure galleon. In the battle of the Bay of Matanzas in Cuba, during the Eighty Years' War, in 1628, Moses Cohen Henriques, under the command of Dutch naval officer and folk hero Admiral Piet Pieterszoon Hein, Henriques stumbled upon a Spanish galleon that had become separated from its fleet in the dead of the night. The daring captain captured it at once. Several smaller vessels were also taken in the same raid. In total, the Dutch fleet captured 11,509,524 guilders (about 6 million dollars) of booty in gold, silver, and other expensive trade goods, such as indigo and cochineal, without any bloodshed. The Dutch gave the Spanish crews enough supplies for them to march to Havana and released them. The Dutch succeeded in taking over a section of Brazil from 1630 – 1654, and Henriques went on to lead a Jewish community during the Dutch rule, and established his own pirate island off the Brazilian coast. After the Portuguese recapture of Northern Brazil in 1654, Moses Henriques fled South America and ended up as an adviser to Henry Morgan, the leading pirate of the time. 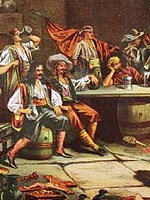 Though Jewish people, and Jewish pirates in particular, did not generally advertise their religion, even in the Golden Age of Piracy, it is safe to assume that many of them were supporters of the pirates: Merchants willing to deal in Spanish goods, and traders who supplied power, shot and rum to anyone with money to spend were parts easily assumed by Jewish merchants with an ax to grind. It’s also likely, since Jews valued education, that many of them served as navigators and officers aboard pirate ships. How many of them were there during the time period. We may never know exactly. But a recent study offers some clues. It’s been assumed that today about 200 individuals in Jamaica can trace their ancestry back to the Jewish settlers. But when the matter was actually examined, it was discovered that the number is over 200,000. 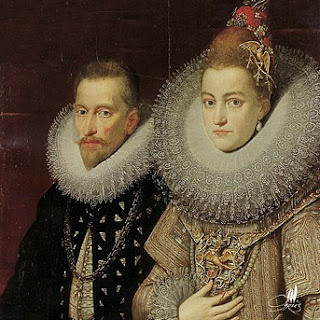 That's not a portrait of Ferdinand and Isabella of Spain, "the Catholic Kings" - it's of their great-great-granddaughter Isabella Clara Eugenia and her husband Archduke Albrecht, the Regents of the Netherlands.